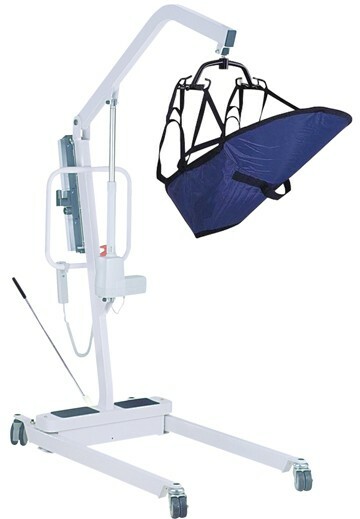 Electric Patient Lift with Six Point Cradle *Note: This item cannot ship faster than Express Delivery 5-7 days - SHIPS FREE! Drive Medical has produced several types of patient lifts, including both manual lifts and electric lifts. 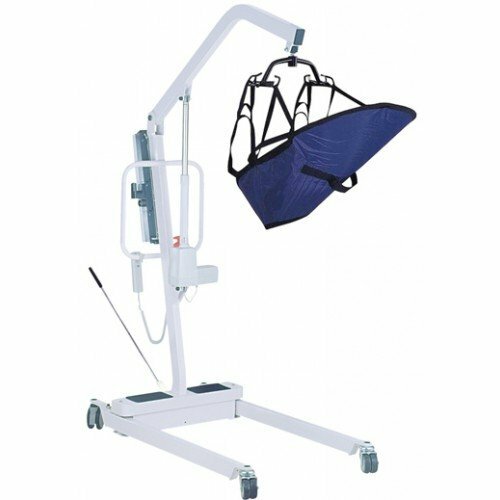 This Electric Patient Lift is a power lift that features a six point cradle that works with 4 point and 2 point slings. The patient lift uses a built in battery that does not need to be removed to be charged. You only need to plug the device into any available, working AC outlet and the lift will charge without any interruption. A "CHARGE" light will automatically shut off when battery is fully charged. Though, it should be noted that the lift will not operate while plugged in. An audible warning sounds when the battery's power falls below 50%. But in the event that the battery completely discharges; the Jumbo actuator pump with emergency button can be quickly switched to manual mode to lower the patient down safely. This Electric Lift easily and safely moves patients from stationary positions. The lift has a high lift range to accommodate transfers to high surfaces. This patient lift is constructed with heavy gauge steel and can support up to 450 pounds. The lift utilizes an extra wide base to provide additional stability, yet the mast and the base can be folded away for easy storage and transportation. Note: Lift Slings sold separately. Boon Height: adjustable 27.5" to 77.5"
We do not carry this product in our own warehouse and therefore cannot mail an owner's manual to you. If you contact the manufacture of the lift they should be able to email or postal mail a manual to an address you provide.